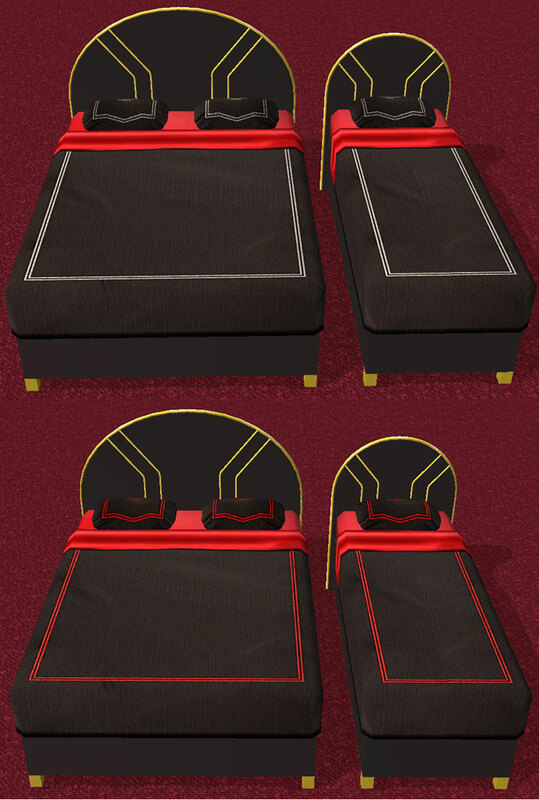 The bedding I made for screencaps of my Ashley Cataline beds was a bit too sloppy for upload. So I've made more realistic textures and managed to get the seams to line up on the single bed. Its basically a recolor of the Maxis blue bedding. The first one has a black comforter and pillows with grayish stripes. The sheets are red silk. The second one has a black comforter and pillows with red stripes. The sheets are red silk. To save time I put them both in the same .rar. Oops. I was so excited about getting it done and submitting that I forgot to thank the folks at the create chat for their support and help. Special thanks to HP for telling me how to do some of the effects in Photoshop! 196 people have said thanks to suceress for this download.